A comptroller audit finds the money was spent in a no-bid contract. A Long Island fire department is under fire from state auditors for its purchase of a race vehicle in a no-bid contract, the News 4 I-Team has learned. The race truck is actually a vehicle used to compete in so-called “drill team” competitions – contests where volunteer firefighters hang onto the backs of the speeding cars and trucks, then jump off to see who can deploy a ladder and climb it the fastest. According to a report by the state comptroller, the Farmingville Volunteer Fire District agreed to pay $49,000 for a race truck in 2004. The purchase was made in a series of installments, with more than $30,000 paid before any product was received. Farmingville is not alone in spending tax dollars on racing equipment. 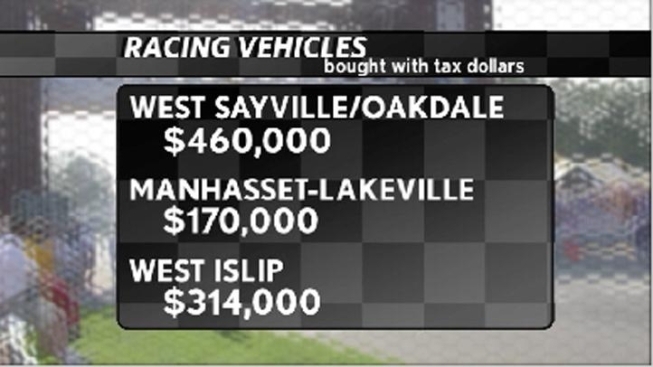 The Manhasset-Lakeville Fire District spent $171,000 on competitive racing from 2000 to 2006, the West Islip Fire District spent $314,000 from 1998 to 2006, and West Sayville-Oakdale Fire District spent $467,000 from 2000 to 2006, according to data from the comptroller. The Syosset Fire District had spent $52,000 from 1998 to 2006, when its board voted to discontinue funding the competitive racing team. "I just think that if it's unnecessary and it's not being used to save people's lives then it's not needed and our money shouldn't go into it," said Farmingville resident Elizabeth Rodriguez. Long Island volunteer fire companies have a long tradition of racing competitions. Departments have defended the use of tax dollars to purchase race vehicles and equipment, saying the competitions build camaraderie and help attract volunteers. Farmingville’s team is called the “Bandits” and their equipment includes a tractor-trailer to transport racing vehicles and a passenger bus to transport the volunteers to and from competitions. The state audit raised other spending questions, including $7,700 in gasoline purchased but not accounted for in department records. The $7,700 equals more than 30 percent of the fire district’s total fuel bill. The chairman of the Farmingville Fire District, Stephen Curtin, said in a statement that he could not comment because of pending litigation on the matter. DiNapoli’s audit also noted several other Farmingville Fire District purchases that were not done through proper competitive bids, totaling $59,488. Purchases included, among other things, furniture at $15,492, jackets for $13,320 and a radio console for $20,485.